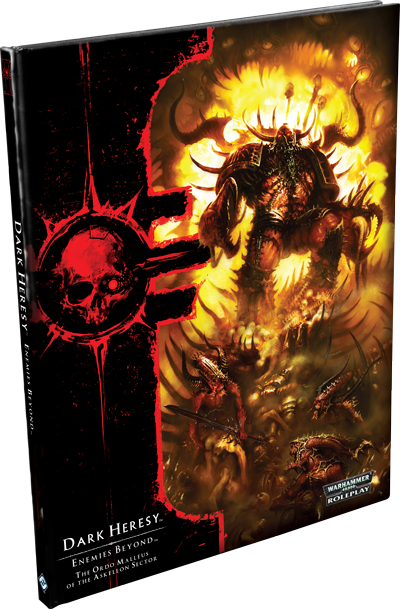 29 December 2015 | Dark Heresy 2nd Ed. The threat of the Daemonic is ever-present across the thousands of worlds that make up the Imperium. From the most populous hive world to the deadly frontiers of a death world, Daemons spill forth from the Warp everywhere, wreaking gleeful havoc and directing heretical worship back to the Ruinous Powers which command them. Against this undying, unstoppable threat, there stands the Ordo Malleus—a small sect of Inquisitors and their Acolytes, elite in their training and hardened by the fires of battle. These men and women are the unsung heroes of the Imperium, but they cannot win their fight alone. To destroy the Daemons that threaten the Emperor’s peace, some may choose to call upon the powers of the Warp itself. 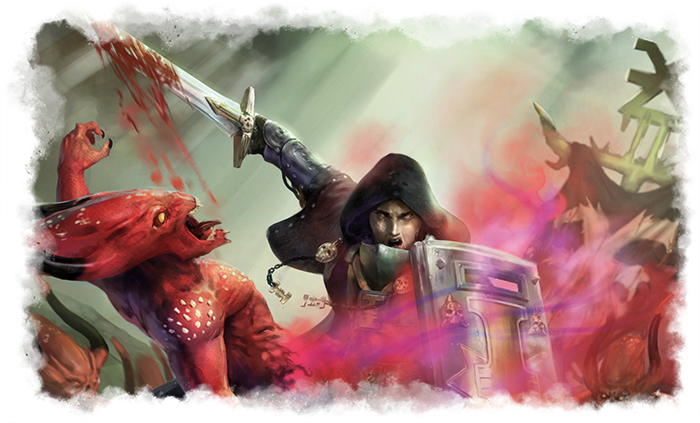 In Dark Heresy Second Edition, you have the chance to make that choice yourself. Today, Tim Cox, writer for Enemies Beyond, explores the new psychic powers and the terrible pacts that you may make in exchange for power. 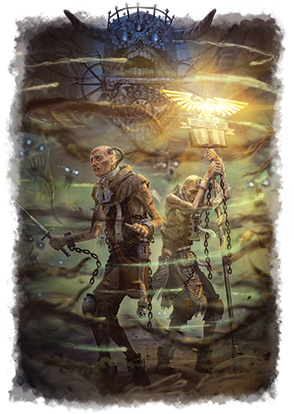 Like it or not, any Acolyte and Inquisitor called to battle Daemons knows that these unholy entities are uniquely vulnerable to psychic powers. Sometimes, the best way to fight the creatures of the Warp is with the power of the Warp itself. 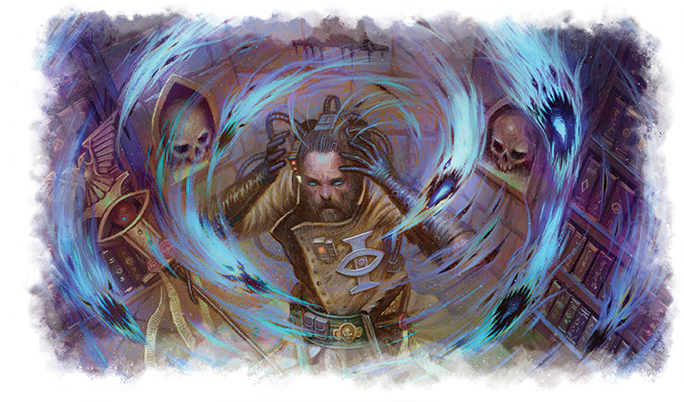 Among the new tools and abilities introduced to the Ordo Malleus Daemonhunters and Acolytes who face the spawn of the Warp, Enemies Beyond includes new psychic powers. While Enemies Within offered minor psychic powers appropriate for untrained wyrds and more powerful psykers, Enemies Beyond introduces two new discipline trees—Sanctic Daemonology and Malefic Daemonology. The first of these discipline trees, Sanctic Daemonology, is one of the most difficult psychic disciplines to master, and certainly the most specialised. The powers of this discipline are geared specifically toward the destruction of Daemons, meaning this discipline is carefully guarded and almost exclusively the province of the Ordo Malleus. Sanctic Daemonology powers range from Banishment, which effectively penalizes a Daemon’s Warp Instability, to Sanctuary, which can keep a Daemonic foe at bay and physically deflect attacks. Other powers, such as Psychic Communion and Hammerhand, amplify the abilities of the psyker and his allies. After all, no mere human can stand alone against a Daemon. Malefic Daemonology is not a true psychic discipline at all—at least not according to the Adeptus Astra Telepathica—but the most profane sorcery. This dark twin to sanctioned Daemonology is not concerned with combatting Daemons, but actually summoning them and bolstering their strength. Needless to say, Acolytes and Inquisitors who delve into Malefic Daemonology are staunchly Radical and heretics in the eyes of most loyal citizens and servants of the Imperium. The new powers in the Malefic Daemonology tree include Summoning and Incursion, which allow a psyker to call forth the beings of the Warp and compel them to do his bidding. Of course, these powers form ideal complements to the new rules for binding Daemonhosts and creating Daemon weapons. With the Possession power, a psyker can even invite a Warp Beast to infuse him with unholy strength for a (hopefully) brief time! The powers of this discipline are especially tempting because of their low costs: Chaos is always eager to ensnare mortals greedy for power. The true costs of Malefic Demonology powers are their effects on the users. Dealing with the Warp is eminently dangerous, and it should come as no surprise that harnessing Malefic Daemonology is a quick way to gain Corruption. Whether you see this as a cost or a benefit depends on your particular psyker. Powers like Dark Flame and Infernal Gaze actually become more effective as a psyker’s Corruption increases! For some practitioners of the dark arts, mere sorcery does not provide nearly enough power. These Emperor-forsaken individuals might even go so far as to make a deal with a Daemon of the Warp and enter into a Dark Pact. Although they are particularly vulnerable to Daemonic influence, psykers are not the only characters who can enter a Dark Pact. Anyone who attracts the attention of a Daemon might have the chance to strike a bargain with a creature of the Warp. An Acolyte who enters a Dark Pact can gain great power by acquiring one or more Boons. These Boons are the benefits that you seek, but whether they are quite what you had in mind depends on how shrewd your bargaining and how carefully you’ve chosen your words. Boons might grant inhuman strength, the unfailing admiration and loyalty of peers, or even immortality. This power comes at a terrible cost, however. Anyone who makes a deal with a Daemon damns himself in the process, but you’ll pay with far more than just your soul. Each Dark Pact also imparts Banes—negative consequences that show the influence of Chaos. After all, with a Daemon, you always get more than you bargain for. The exact nature of a Bane corresponds to the Boon granted. A character who bargains for great strength or martial prowess might take on a vaguely bestial appearance pleasing to the Blood God, while one who wishes to create a perfect work might find himself addicted to the pleasures of the Dark Prince. In addition to these unnatural “side effects,” the Daemon must get something out of the bargain. While this might simply be the bargainer’s soul, it could also entail some act of servitude, ritual obeisance, or even a living sacrifice. I hope players and Game Masters enjoy incorporating the new psychic powers and rules for Dark Pacts into their Dark Heresy campaigns. And if these powers prove a little too tempting, well… that’s how the fall to Chaos begins! With the power of the Immaterium at your call, you may strike down even powerful Daemons—but can any mortal truly resist the temptations of the Warp? Decide whether you’ll walk the path of righteousness or abandon your soul to Chaos in Enemies Beyond, the newest supplement for Dark Heresy Second Edition! Pre-order your copy of Enemies Beyond at your local retailer today.